The Forum für Fotografie presents Manfred Paul: Still Time. 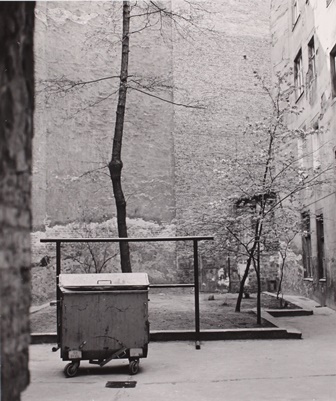 Black and White Photography 1972-1990, an exhibition of three series of works including cityscapes, portraits and still lifes, by the outstanding yet lesser-known German photographer Manfred Paul. 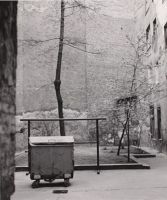 The exhibition presents the urban landscape of East Berlin, showing unrenovated areas of the Prenzlauer Berg district, alongside portraits of young adults of this period and still lifes taken between 1983-1985. The Berlin cityscapes captured by Manfred Paul give an insight into usually unseen aspects of East Berlin’s past. Paul’s images not only testify to the history of this area, but also convey especially unusual, silent and almost lost atmosphere of the time. In his sensitive and considered look at the often deserted and rather impoverished streets and backyards of East Berlin, Paul achieves a balance between melancholy and powerful beauty. Paul prevails in preserving quiet poetic traces, the forgotten corners, the offbeat and lost moments. Masterfully, he manages to give the otherwise dreary, a silent charm and splendour. It is not a documentary approach which underpins his images, but rather the instinct of a poet, able to wait for the right moment to capture something simple in all its complexity. It is in his still lifes that Paul’s ability to give significance to the simplest of things is at its finest. The play between the simplicity of the objects and the sparse atmospheres created, forms the framework for his construction of tense and subtle images. In his portraits Paul addresses his subjects with sensitivity, using them as an inlet to embark on a deep exploration of others. Here the work is less about documentary details and more about the powerful and intense translation of emotional states. Manfred Paul was born in Schraplau (former East Germany) in 1942. He started work as a photography lab assistant before attending the Academy of Visual Arts Leipzig (HGB) and the Academy of Film and Television Babelsberg (HFF). From 1974 to 1994, Paul was professor for photography at the School of Advertising and Design (FWG) Berlin. From 1995 until 2007, he taught as professor for photography and audiovisual media at the FHTW in Berlin. He also held numerous visiting lecturer positions including at the HFF Babelsberg (1073/74), the HGB Leipzig (1991/92, 2006), the Academy of Fine Art Dresden 1993-1995) and the Academy for Film and Television Munich (1995). Manfred Paul lives in Berlin. Alongside exhibiting, he is a freelance journalist active in Germany and abroad, with work presented in numerous publications and editions. Paul’s work can be found in international collections including the Berlin Gallery Collection; the Kupferstich-Kabinett, Dresden; Ludwig Museum, Cologne; Musée de l’Élysée, Lausanne; MoMA, New York; Biblio¬t¬hèque Natio¬nale de France, Paris, as well as other private and public collections.